by Frederick B. Smith, Jr.
Editor’s Note: This is part one of a three-part series on the history of Camp Ginger Quill, an historic family compound located on the mainstream Holy Water on the Au Sable River. The essays in this series are authored by Frederick B. Smith Jr. A short autobiography of Mr. Smith can be found at the end of this first essay on the history of the building of Camp Ginger Quill. As a series these essays provide a nice first-person glimpse into another time and another way of life on the Au Sable river. 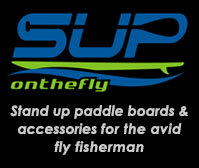 Look for the next installment in our series tomorrow. Camp Ginger Quill was built in 1928 by my grandparents, Bay City businessman Henry B. Smith Jr. and his wife Katherine. It began as a small cabin just downstream from the present site. While making glue on the stove one evening, a small fire started and spread quickly. Fortunately no one was hurt but the cabin burned to the ground. 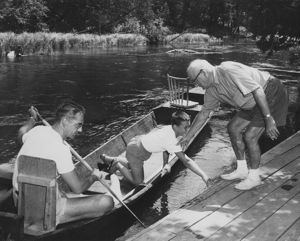 Three generations of the Smith family at Camp Ginger Quill: Frederick B Smith, Sr., Frederick B. Smith, Jr., and Henry B Smith Jr. on the dock with an Au Sable riverboat (Photo: Bay City Times). Construction began the following year on the first cabin of the present complex. The “Main Cabin” as it was always known, was initially much smaller than it is today. It included three bedrooms, one bath, the living room, and a small kitchen. A screened porch ran the length of the cabin facing the river. The green dock in front of the “Main Cabin” had a retaining wall that ran from the stairs to the down river end, and which also acted as a bench. A wrought iron sign hung from the light post near the stairs depicting two fishermen in a canoe, a rod bent by the pressure of a large trout, and the word “Ginger” at the top and “Quill” at the bottom. That sign was used as the Ginger Quill logo. A live well was in place at the down river end of the dock so we always had fresh trout. Fish that were not eaten in three days were tagged and released. No one has ever caught any of the tagged fish, however. The live well was a source of endless fascination for the grandchildren. The Camp Ginger Quill dining room. The “Dining Cabin” was built the year the “Main Cabin” was expanded and contained living quarters for the caretakers, a large kitchen and a beautiful dining room with a sitting space around a fireplace at the downriver end. There was also a screened porch at the dining room entrance. A long dock ran in front of the dining room and was accessed by two sets of stairs with log railings. At the upriver end of the dock was a boathouse topped by a screened gazebo. The gazebo was furnished with bentwood furniture and dominated by two bentwood swings. The view upstream was wonderful. There was a weather vane on top of the gazebo with the words “Wise Men Fish Here”. 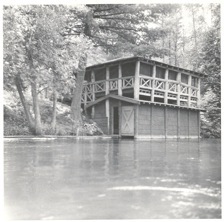 Eventually the boathouse developed structural problems and was torn down. The gazebo was moved back on land where it sits now. The “Dining Cabin” also sported a tennis court, which was eventually overtaken by the elements. The “Main Cabin” and the “Dining Cabin” were connected by a wooden walkway that followed the basic path of the river. Henry and Katherine’s two sons, Henry III and Fred, were now in their early teens. A log cabin known as the “Boys’ Cabin” was built about halfway between the “Dining Cabin” and the “Main Cabin.” The two “Boys” helped in the construction and hence the name “Boy’s Cabin.” It was a very basic log structure with one bathroom, one private bedroom and two large open rooms, one at the down river end containing only beds and the larger central room with a sitting area around the fireplace and two beautiful custom bentwood beds. The walls were decorated with Henry III’s and Fred’s high school pennants, snowshoes, snow skis, a few stuffed animals and other sports items. There was a small screened porch and a very small dock. 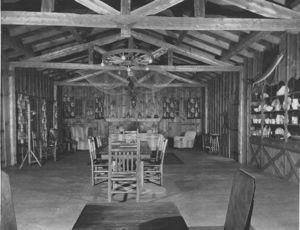 The “Boys’ Cabin” was often a favorite place for the teenage children and grandchildren as it offered some separation from the adults. The “Boys’ Cabin” always had bats which made it less attractive to the females of the family. We would often take the snowshoes off the walls to combat the bats. Other small buildings were two behind the “Main Cabin” – the laundry, which is now a bedroom and bath, and a garage/tackle room/outboard engine-firewood storage room, which is now a garage/bedroom/tackle room. There was a large garage by the “Dining Cabin” used for maintenance equipment, boat building and repair, and winter boat storage. Next to the garage was a gasoline storage tank. At least two Au Sable riverboats were normally tied to the “Main Cabin” dock. The caretaker was usually a guide and the boats could be motored upstream with small outboard motors. Sheared cotter pins were common when the prop hit rocks, shallows or submerged logs. There is a path along the river upstream from the gazebo to Knight’s Bridge so we could wade a long stretch of river from Knight’s to the original cabin site. Our family cabin complex, Camp Ginger Quill, is located on the “Holy Water” about a half-mile upstream of Wakeley Bridge. As you float down from site of Knight’s Bridge, an old wooden footbridge which is no longer there, there was a beautiful view of the dining cabin, boat house and gazebo. Those building are now gone and a beautiful new log cabin have been build in its place. At the Dining Cabin the river bends ninety degrees to the left and flows down toward Ghoul’s Hole, passing both the Dining Cabin and the Boy’s Cabin on the right. At Ghoul’s Hole, a deep hole and home to many very large trout, the river takes another ninety degree turn to the right and flows past the Main Cabin. I have been told that the land directly across from the Main Cabin was the original site of Trout Unlimited. I have had a wonderful life. I have traveled around much of the world and lived in many beautiful places. My fondest memories, however, are of the times spent along and in the Au Sable River at Camp Ginger Quill. Camp Ginger Quill was sold in the late 60s just as I was graduating from Alma College and about to enter the Air Force. I was the first of six grand children to leave Michigan. Of the two that remained, only one stayed in Bay City. As my grandparents, who built Ginger Quill in the 1920s, eventually became too old and sick to use and care for it properly, they transferred ownership to their three children. These three families, all with children of college age at the time, didn’t have the means to maintain the property as their parents had nor did they all share to same vision for it’s use. The women who had previously been able to relax when they visited Ginger Quill were now forced to do all of the cooking and cleaning, often cleaning up after the previous guests. The men became painfully aware of the costs involved in maintaining the large complex, even at a minimal level. Every attempt was made to sell the complex as a single unit but the first owner immediately split Ginger Quill into three parts, kept the Main Cabin and sold the two remaining parcels. The Main Cabin was eventually maintained by a partnership of several families. The Boys cabin was sold to an individual and the Dining Cabin fell into disrepair and had to be torn down. Over the years I have returned to Michigan from our home in Texas to canoe and fish the Au Sable, each time stopping by Camp Ginger Quill hoping meet the new owners and share my memories. Finally about fifteen years ago there were people sitting on the Main Cabin dock. They were so eager to hear about my family and the history of Ginger Quill, I started gathering information and old photos to write my own history not only of the place but also of the magical quality it held. Mostly this history was written for my family, memories that we all shared but had begun to forget. I was born in Jacksonville Florida in January of 1945 where my father was stationed in the Navy. Shortly after the war we moved back to Bay City Michigan where my brother Geoffrey and sister Mary Jo were born. After graduating from Alma College in 1967 I joined the Air Force. After officer school and a year of pilot training in Lubbock Texas I was stationed in Del Rio Texas for nearly five years. I met and married my wife of 42 years while in officer school and our only child, our son Scott was born in Del Rio. After separating from the Air Force in 1973 I was hired as a pilot by Delta Airlines where I served for fifteen years in Houston and another fifteen years in Dallas, retiring 2003. We have since built a cabin in the Ozarks of northern Arkansas on the White River about five miles downstream from Bull Shoals Dam. We’ve named the cabin Ginger Quill Cottage and are trying hard to encourage fly fishing on the White with limited success.